Have you ever had brussels sprouts on pizza? I’m sure some of you may be thinking “yuck!” and quickly click away from this page. But hold on, not so fast. Brussels sprouts on pizza is really, really GOOD! 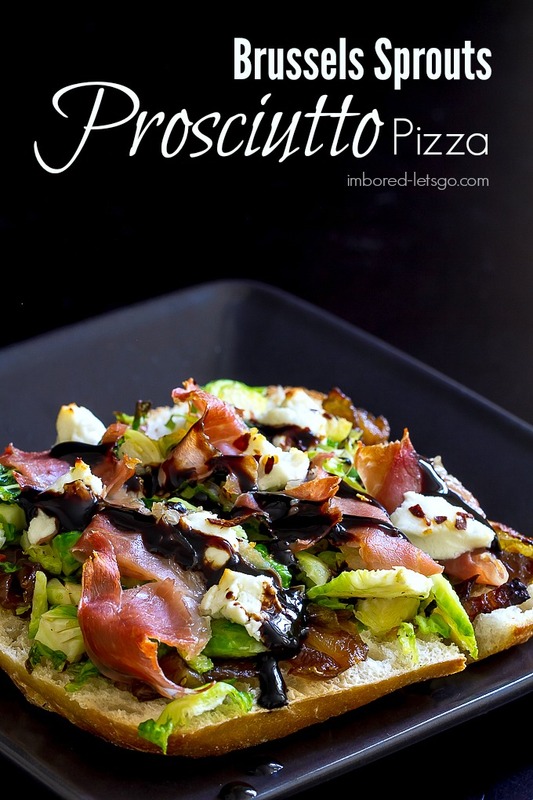 If you’re a fan of brussels sprouts you’re gonna love this Brussels Sprouts Prosciutto Pizza and if you’re not a sprouts fan, this might just change your mind! So here’s the thing I don’t enjoy so much about food blogging…certain times of the year I feel pressured to make certain things for this blog. Like now, just in time for Thanksgiving, it’s all Thanksgiving recipes. Everywhere. And then I’m suppose to be making Thanksgiving leftover recipes. October was all about pumpkin and Halloween. Next up, Christmas. Then comes January and it will be detox and diets. It never ends! So for the entire month before the actual holiday I’m cooking and experimenting with holiday recipes that by the time the actual holiday comes around, I’m so over it and don’t want to cook/eat any of it! So why am I telling you this? Because I’m starting to feel very guilty that I haven’t bombarded you yet with a plethora of Thanksgiving recipes! Sure I made a really good stuffing muffin recipe this year, but I’m thinking at this point, that may be my only true Thanksgiving recipe I’m posting. I’m just not feeling it this year. No worries…I’m still all about mixing up some festive cocktails for the holidays (did you catch the Pecan Pie Martini or my 5 Fall Favorites?). I never get bored creating cocktails and have a few more up my sleeve to share in the coming weeks! Stay tuned. Okay, rant over. On to brussels sprouts. Instead of coming up with a new and creative way to roast brussels sprouts (is there REALLY anything new that hasn’t been done already?) I made a pizza with them instead! In the past I’ve made pizzas with naan bread but this time I used ciabatta bread for the crust. I just love the crispy crust and looser (more holes on the inside) texture of ciabatta. In the first picture above I used a square ciabatta sandwich roll (with some balsamic glaze drizzled on top – yummy) and the picture below are smaller rectangle shaped ciabatta sandwich rolls. Both were good to use so it really doesn’t matter what shape you use. If you want to cut them into slices for appetizers I recommend the rectangle shaped rolls or a large ciabatta loaf. These pizzas have caramelized onions on them which are freakin awesome! I experimented making caramelized onions in my crock pot overnight to use for this pizza. Not sure what I did wrong but they got a little burned. I think they probably needed a few stirs throughout the night. I salvaged what I could, then decided to cook up some more on the stove while I had my morning coffee and did some computer work. Caramelized onions are so much sweeter and tastier than sautéed onions, but they take some time. About 1-1 1/2 hours. Low and slow is the way to cook them. They may take long to make, but on the bright side, they don’t require a lot of attention so you can do other things while they’re cooking. If you don’t have the time, just sauté the onions until soft and golden, it’ll still be delicious. 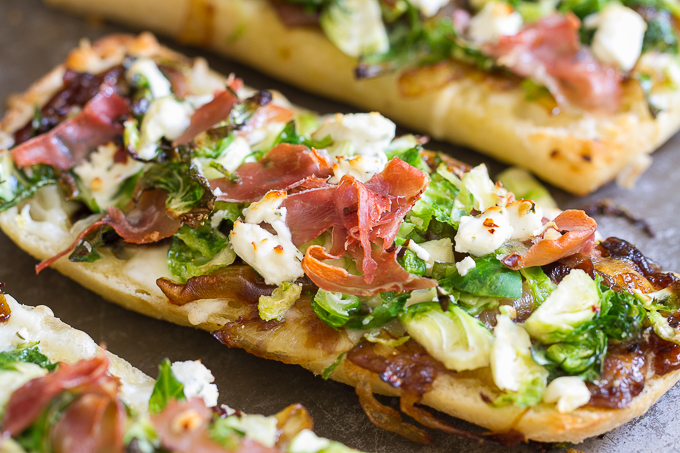 Finally, bake the Brussels Sprouts Prosciutto Pizza on a regular baking sheet or a pizza screen for about 8-10 minutes. Just enough time to melt the cheese and crisp up the prosciutto and edges of the sprouts. Using a pizza screen will produce a crispier crust – something I love! This is how I plan to eat my sprouts this holiday season. But if you really insist on a more traditional side dish, I made a great one last year you’ll love…get the recipe here. Add balsamic vinegar, stir and continue to cook a few minutes until absorbed. Remove from heat and set aside. While onions are cooking, trim brussels sprouts and thinly slice. Put sprouts in bowl and toss with 1 tbls. olive oil (if you have garlic flavored olive oil you could use that) Add a little salt & pepper to taste. Slice ciabatta rolls in half lengthwise. Brush with olive oil. Cut garlic clove in half and rub over bread. 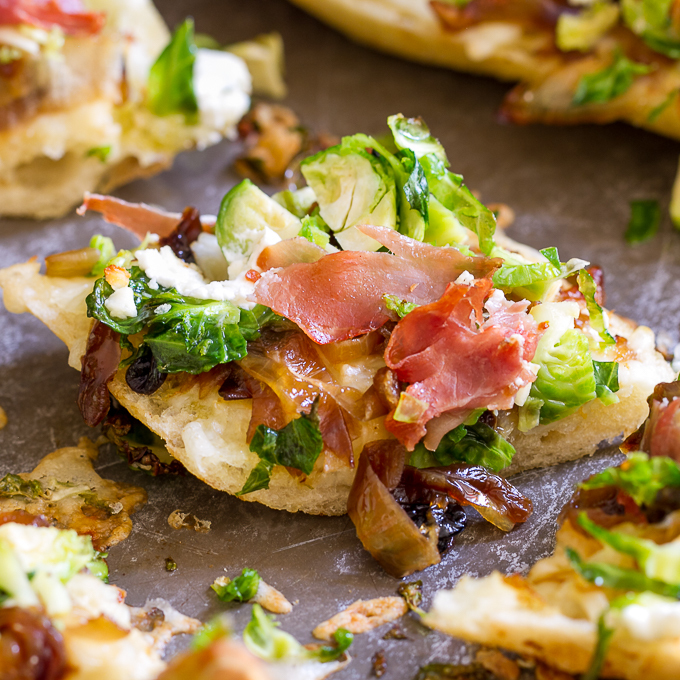 Top each half of ciabatta with some mozzarella cheese (about ¼ cup), then evenly distribute some onions and brussels sprouts on top (you may have extra onions and sprouts). Tear apart prosciutto into pieces and add to pizzas. Dot with a few chunks of goat cheese over each pizza. Sprinkle with a pinch of red pepper flakes. Bake in oven about 8-10 minutes until bread is crispy, cheese is melted and sprouts begin to brown a bit. Opt. drizzle with balsamic glaze. I’m on my way to the grocery store to get the ingredients I’ll let you know how it turns out!! Maybe because this is my first round of holidays as a blogger, I’m not sick of making holiday food. I’ll let you know how I feel next year-haha! Beautiful photos Judy!